Because the Chevy Aveo RS is moving upscale, cheap Americans will need new crap cars to waste their pointless lives in. 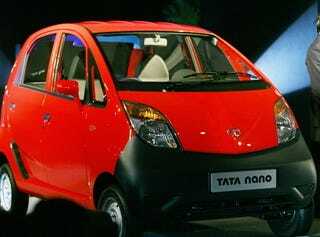 Crap cars like the Tata Nano, which may end up here in 2013. All of this is according to Tata's chairman Ratan Tata, who is running around the Delhi Auto Expo telling people they're aiming for a release within the next three years for non-developing areas like the U.S. and Europe. Hell, by 2013 the U.S. may be a developing market again.